The man who has traveled all over the wold looking for material for his writing, the man who is foremost among the human interest writers who combine humor with human interest, feels the call of the wild in his veins and a longing in his heart to answer the call. Secondly, what exactly is this “call of the wild” mentioned in the article? While Roberts indeed traveled extensively, particularly during his Post years, I am not sure he did so because of the “call of the wild.” What Roberts wanted more than anything was to get away from the busyness of the city to a quiet place so he could write. In his I Wanted to Write, Roberts discusses how often he sought to leave the Post to pursue his passion for writing. Well, as one reads further into the article, the “call of the wild” Roberts experienced was the spring training site for the Boston Braves: “…and when he saw the Boston Braves training field, he heard the call of the wild, and it got him strong.” The reporter then segues into a brief bio of Roberts’ earlier days in Boston as a reporter – days that prepared him as a preeminent human interest writer for the Post. Kenneth Roberts is a husky, wholesome, handsome man. You can call him handsome without spoiling him, because he will convince you that you are joking. The attentions which his admirers among his readers shower upon him, has not turned his head. He is real. He is a type of a fine splendid American who has accomplished something worth while. Not quite the description you’ll find of a prominent figure today! I wonder if the reporter was using the phrase “call of the wild” ambiguously here on purpose, first alluding to the Boston Braves (the call of wild Indians?) and second, to the call of St. Petersburg. The former makes some sense, but the latter seems to misunderstand Roberts (if the latter is indeed intended by the reporter). Roberts did not necessary long for the wild of St. Petersburg, but instead expressed a feature of Roberts that helped define the man – a strong loyalty to his roots. I have yet to write a book, and if I do have the opportunity to author something worth publishing, I highly doubt that Hollywood will come knocking down my doors asking to do a film based upon my book. I am quite fine with that. If one considers the sheer number of books published each year compared to the number of movies produced based upon a book, the number of these kinds of movies is quite small. With that in mind, it would seem the author of the book would be quite honored to have a film produced on his own work. But that is not the case with Kenneth Roberts and the 1940 Northwest Passage with Spencer Tracey. My correspondence with Tracey Levasseur (see recent post on the envelope addressed to Roberts) reminded me of Roberts’ disdain for Hollywood – a disdain that comes through in Chapter 1 of his I Wanted To Write. With the publication of Northwest Passage, I had my first direct – a profoundly depressing – contact with cinema circles. …the dauntless and hard-boiled leader of the original Rangers had horribly turned into the sort of person who bursts into tears at a crucial moment of an arduous expedition; a woman character, shrewish and a harridan, had become a sweet and mealy-mouthed nonentity; all motivation had been discarded; the book’s thesis had ceased to exist; its essential portion, on which the name of the book and the film were based, was ignored; and a Hollywood flavor was added by introducing a sequence stolen from Arundel. In our correspondence, Tracey pointed out that tt’s no wonder, then, that no “Part II” followed the 1940 film (recall that “Part I” was part of the 1940 film). It is probably a reason why, she surmises, why his works are still under copyright – to protect them from being mishandled by Hollywood producers. One of my favorite things to do regardless of what town I’m in is to find a used book store (preferably the mom-and-pop book stores, but Half Price Books works fine as well) and just lose myself in the philosophy, theology, and church history sections, looking for books to go toward my dissertation and Ph. D. comps. Though I rarely find any Kenneth Roberts books, I always do an obligatory scan through the fiction section, history section, and cookbook section (for Good Maine Food, of course!). I must say that I unfortunately leave empty handed when it comes to Kenneth Roberts books; if there are any Roberts books in Louisville, they’re usually much later editions and worth only $1 or so. Tonight, however, I found a pleasant surprise at Half Price Books. Located in the “rare/out of print” section, I found a book titled Dowsing, Water Witches and Divining Rods by Howard V. Chambers. I initially skipped over it, intent on finding that Roberts gem, but as I scanned over the titles again, my eyes stopped on the Chambers book and my curiosity was piqued. Kenneth Roberts was known (infamously, primarily) for his interest in water dowsing toward the later part of his life. His interest was such that he developed a relationship with a local dowser (Henry Gross), sought Gross’ help in finding water on his Rocky Pastures land, and wrote three books on dowsing. Though Roberts was enthusiastic about what dowsing has to offer (as opposed to the more modern methods of finding water), many contemporaries derided Roberts for his interest in such a “bogus” practice. Regardless of the noise from his critics, Roberts remained loyal to Henry Gross and convinced of the validity of dowsing to the day he died. Chambers’ book devotes a full chapter (Chapter 9: Mr. Dowsing-Henry Gross) to Kenneth Roberts and his investment in Henry Gross’ dowsing ability. Chambers’ entire book is a sort of history on the art of water dowsing, and in Chapter 9, he sets forth dowsing in the modern era, highlighted by Roberts, Gross, and the events surrounding the two men and their efforts to bring water dowsing to the public conscious. The chapter is a quick read, but provides a fascinating look into a little-known (perhaps ignored) aspect of Kenneth Roberts’ life. Kenneth Roberts was a fiercely loyal man – loyal to his work and his friends – and this was no less the case when it came to water dowsing and Henry Gross. A study in Roberts’ involvement with water dowsing would be a study in and of itself – a study, I am sure, that would help to shed more light on this near-forgotten great American author. 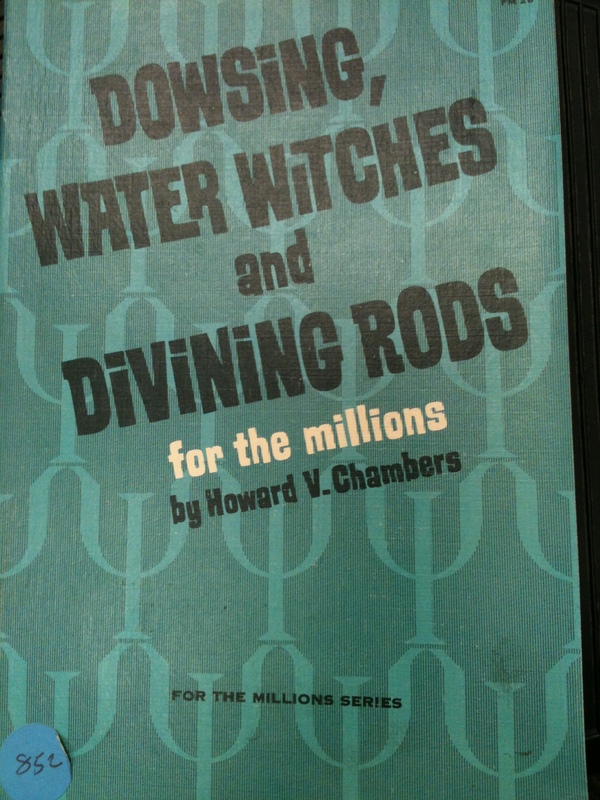 Chambers, Henry V. Dowsing, Water Witches and Divining Rods: For the Millions (Los Angeles: Sherbourne Press, Inc., 1969), 156 pp. It’s hard to believe that I’ve been running this site for three and a half years now; not only has it been a joy getting to do something that Kenneth Roberts fans have found needed, but I’ve also enjoyed getting to meet new people who share in the common interest of keeping alive the appreciation for Kenneth Roberts and his works. One benefit of meeting fellow Kenneth Roberts enthusiasts is getting to hear stories or see items that would otherwise go unnoticed, which leads me into another new series for this site – Kenneth Roberts Memorabilia. 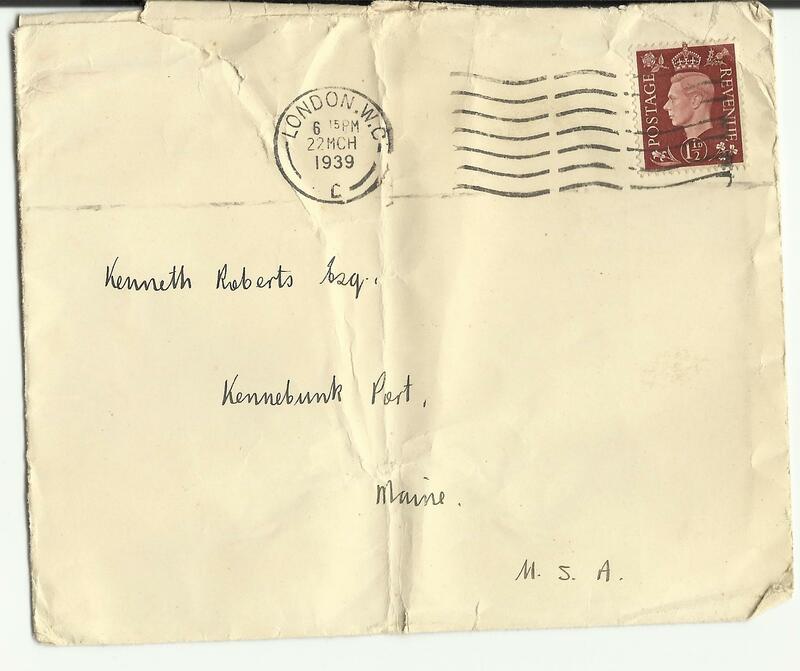 An envelope addressed to Kenneth Roberts ca. 1939. Courtesy Tracey Levasseur. 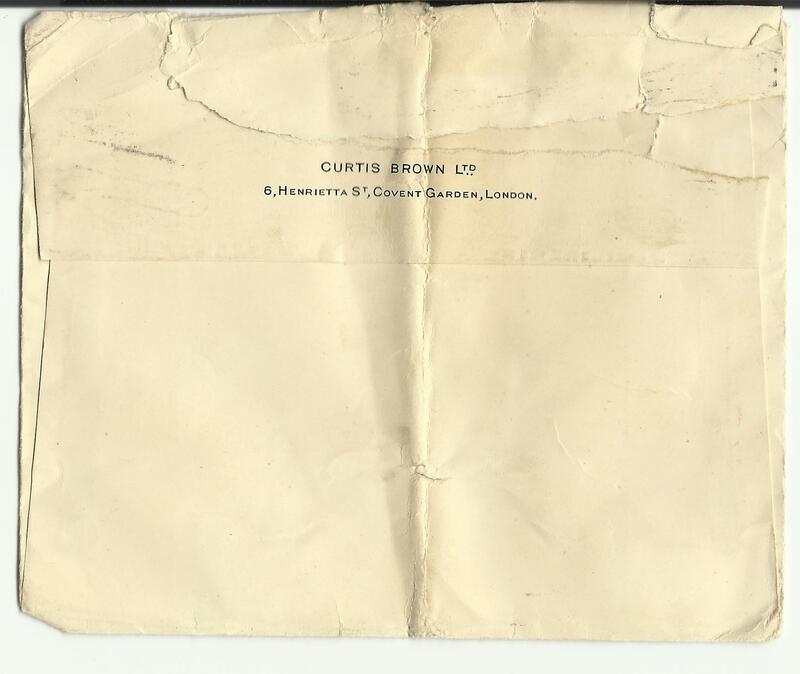 The envelope came from Curtis Brown Ltd in London. This was and still is a literary agency which in its early days represented European authors in the US. However after WWI they started representing American authors in Europe. This envelope is postmarked 1939 which I suspect was a correspondence to Roberts regarding representing him in Europe. 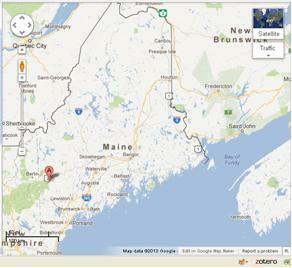 The address is his Kennebunkport address, which is Rocky Pastures as he would have moved into this house by 1939. A great piece of history of one of America’s greatest authors. Much thanks to Tracey for sharing with us!